Description: corticosteroids increase the risk of glaucoma (increased eye pressure) and cataract. These side effects may be asymptomatic or cause symptoms such as a decrease in visual acuity, pain in the eye and sensitivity to light. Frequency: complications of the eye are difficult to estimate. They depend on the duration and dose of corticosteroids. 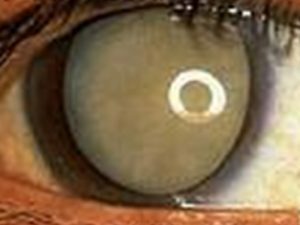 Cataract is relatively common after several months of orally administered corticosteroids (for example: approximately 10% on average in patients with asthma) although the cataract can be completely asymptomatic and have no visible effect on the patient. Compared to patients that are not given prescribed cortisone, the risk of cataract appears to triple when corticosteroids are prescribed. The risk of glaucoma usually doubles. Subjects at risk: all patients undergoing long-term corticosteroid therapy are at risk of experiencing ocular complication, including those who use inhalers (e.g. asthmatic patients). Cataract and glaucoma are likely to affect even patients given low-doses of cortisone (less than 10 mg per day). In general, a higher dose and longer treatment leads to a greater risk of suffering from these side effects. The risk increases with age and with those who have existing conditions such as diabetes. Long-term versus short-term treatment: short-term treatment carries little risk of ocular complications. Patients that take cortisone for several weeks/months are at more risk. Prevention/treatment: there are no known preventative treatments except that of finding the lowest dose of cortisone necessary and taking it in the shortest possible period of time. Surgical treatment of cataracts has proved effective in removing them. Screening: an annual eye examination, complete with an eye pressure test is recommended for patients undergoing long-term corticosteroid therapy. Reversibility: cataract is not reversible after discontinuation of corticosteroids. However, eye pressure is known to go down in the weeks after cessation of treatment.